When Do I Conduct Outreach? While tax credit outreach efforts are needed year-round, most successful campaigns find that early planning in the summer or fall in advance of the tax season is critical. 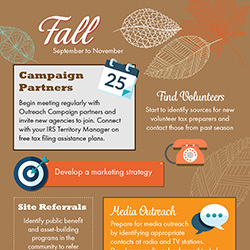 Below is an overview of a basic timeline for conducting an Outreach Campaign. Use this as a starting place to develop a plan and calendar that is suited to your community. Depending on the scope of your campaign, some actions won’t apply and other activities you will need to add.